Measuring and gauging the stock market value is important. Funny coming from a “value” guy like me because what the market does shouldn’t matter. But before you call me a hypocrite and shut down this article, hear me out. I like to relate investing with concepts from daily life. It puts things into perspective and context. Money and seeking profits has a way of clouding up common sense and numbing danger signs. Something that I am all too familiar with. The reason for bringing this up is because you don’t want to fall into measuring and seeking vanity metrics like Liquidity Services (LQDT). One of their key performance indicator is to count how many people create an account on their site. Useless because it’s a lone indicator without relation to anything. That’s why financial metrics are a combination of two or three different numbers to put things into perspective. A couple of years ago I made a goal to work out and put some meat on my skinny frame. The first thing I did was measure my starting weight. In order to achieve my goal, I needed to know my starting point to formulate a plan and stick to it. Same reason why you take annual health exams. It helps you gain a better understanding about your body and what to do going forward. It’s no different for your portfolio and the market. I try to get a sense of stock market valuation to determine how to proceed. To come up with a game plan. Where do I see myself in this market? Is my portfolio constructed with enough margin of safety? How much cash should I be holding? Is it time to just sit back, read, write and learn instead of trying to find a cheap stock everyday? To answer any of these questions, there has to be a starting point, and the starting point for any portfolio is always in relation to the stock market value. If you are like me, your portfolio goal is not as clear as it should be. Trying to beat the market or achieving the best possible return isn’t a goal. How do you get the best return in a rising market? How do you beat the market in a crashing market? Notice how putting things into context makes the same thing look brand new. I don’t have any fancy financial models to calculate the value of the market. I don’t look at corporate earnings, GDP or other economic factors to try and predict whether there is more room to grow. In fact, I don’t understand everything about the economy, and I don’t try to. Instead, I measure the market using Graham’s simple net net principle. It’s designed to provide only one clear signal. The market is cheap, or it isn’t. Important point here is that I did not say expensive or overvalued. Just not cheap. Net net stocks are dirt cheap stocks. The more there are, the cheaper a market is. If net nets are hard to come up, the market is not cheap. No rocket science here. Just a simple way to measure the temperature of the market. I’ve pulled up a list of stocks trading for less than NCAV via portfolio123 and right now there are 72 stocks priced below NCAV. Out of 72, 29 are OTC stocks and 5 are Chinese stocks. That leaves just 38 net nets existing today in the universe of 6000-7000 stocks on the national exchanges. It’s clear that the stock market is not cheap. The other benefit of pulling up a list of net nets to determine the value of the stock market is that you get to look at some cheap ideas. If you follow net nets, you’ll recognize a lot of the names below. You can download the spreadsheet which includes the stock price, market cap and NCAV. I’m no Robert Shiller, but at least Graham would agree with me that the market is not cheap. A nice article. Thanks. Your article leaves me more questions…… what is the average number of price/NCAV during a bull market? Does this number have any predictive power, or simply a sign of “moment not working for Graham technique”? Why not using GNP/total stock value, mentioned by Warren Buffett as his measurement of market temperature? Not that any of us follow the market, but the your screen above just confirms that companies cost more. Not saying their “fair / overpriced” just cost more and a lot harder to find value with a MOS. Good question. I thought about the same questions. Regarding number of NCAV stocks, this should be more of a follow up article because I’ve been doing it manually so I don’t have proper data with me. It will be a good idea to go through how many net nets were available at the beginning of each year and see whether there is a trend to how it works. For GNP/total stock value I read the same thing at http://www.gurufocus.com/stock-market-valuations.php but it’s difficult to get the latest number when I want. Very small handful that meet the 2/3 criteria and as you said, very difficult to find cheap companies with MOS. The only areas I’ve found were in micro and small caps. Other than that, forget about it in the large cap space. Hey Jae, could you describe the rules you’re using for the screen? I am trying something with MktCap<(AstCurQ- LiabTotQ) but getting way different results. Could you share some hints on the narrowing process you're using? For some context, here’ Table I from this paper. I believe Table I is those companies that satisfied 2/3 NCAV. I’d be curious what the ratio is (to total stocks). I think Montier’s book may have had some data on that as well. Regarding Montier, figure 22.3 was reposted here. That’s a global figure though. Side note: Do your comments accept html? The other issue with GNP/Total stock Value is that it fails what I call the “matching principle”. GNP measures total revenues for the whole nation. Total stock value ignores debt financing and it ignores private businesses. I think GNP / (Total debt + stock market + private company value) would be more appropriate. Essentially GNP/stocks will vary if you vary leverage and if you vary the ratio of public/private company values. Always places to search for the little guys. Many people are saying they can’t find anything, but just climbing down the market cap ladder brings up new ideas. Good point about the debt financing and private businesses. Also it includes international revenue as well. I dont know how to measure that. I have other criteria. Here’s a screenshot. Yes according to that paper, its for stocks that were less than 2/3 NCAV. Do you have the full pdf to that paper. I’d like to share it without asking everyone having to sign up and look at it from the web. Also found this paper showing results from 1981 to 2000. Page 11 of this pdf. Here it is for others if you are reading this comment. I do have the paper but I’m reluctant to share jstor papers. The last guy who did that didn’t turn out too well. 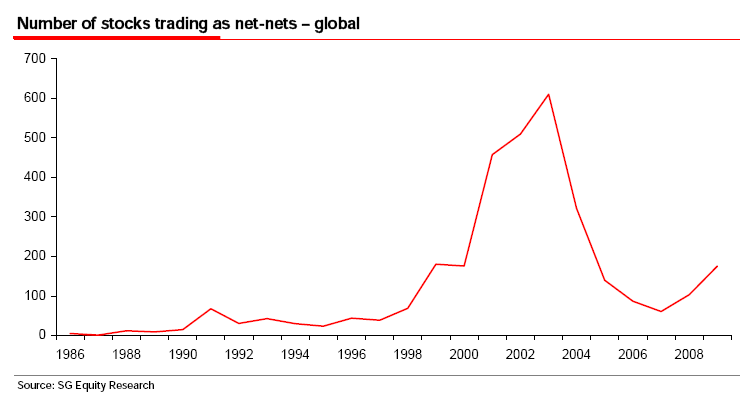 And I see net-net portfolios had a lot of stocks in the late 90’s. Thanks, I guess it’s more like a Price/Sales ratio. Both Carl Icahn and Warren Buffett confirmed this week that the market in general is fully valued. Though there are stocks which could be interesting to buy for a value investor, the choice is very limited. I’m planning to do a follow up article going over as many years I can find from different sources to see how many net nets were found in any given year. That should be interesting and show whether this really can be adopted as a market valuation tool. Sounds interesting! You could even create a graph with a net-net line, and add a line for the 10yr T-note % yield to see if there’s some kind of correlation between them. Great idea. Will do. Just need to be able to find sources to provide that data.